Miss Geeky Birthday! Plus a Giveaway! I almost forgot about it, but last Wednesday the 17th of February was my 3rd blog birthday. Or anniversary. Whatever you’re supposed to call it. So today I’ve been blogging now for exactly 3 years and 3 days. Yay! It’s not the actual MissGeeky.com birthday; I started this site months later that year in September (and moved all existing blog posts from the old site to here). For me though this date is the more important of the two, cause this is when I started realizing how much I love writing about the stuff I like and sharing it with you all! It seemed kind of apt to celebrate it today, cause in real life I’m having my birthday party today. Which weirdly enough is in 3 days time. So this 1 day falls exactly in between my blog birthday and my real birthday (3 days after and 3 days before). So to celebrate both my blog birthday and my real birthday, I thought I’d hold a giveaway for my dear readers. 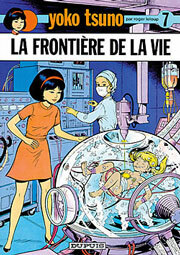 The winner will receive a copy of the Yoko Tsuno comic “On The Edge of Life” (below is an image of the French version, but don’t worry the giveaway here is for the English one). All you have to do is leave a comment behind with what your favourite blog post on MissGeeky.com has been in the past 3 years. The competition ends on March 6th 17:00. I’m still amazed that it’s already been 3 years! In that time I’ve written 820 posts with around 1500 comments, and have slowly gained 25000 visitors per month. Thanks to all you readers out there! I’m glad you’re all enjoying what I write about.